Plug in, turn the housing to the right, done. 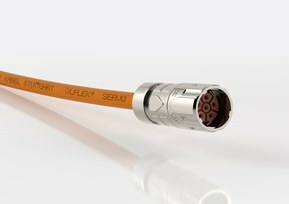 Quick-connect circular connectors are becoming an ever more popular solution for cabling in servo drives. But users are often frustrated by the small number of manufacturers who offer this standard. Until now. “The market is extremely interested in a high-quality alternative”, says Joachim Strobel, product manager for EPIC® connectors at LAPP. With the EPIC POWER LS1 with quick-connect system, that alternative is now available. The connector gives users the freedom of choice, and offers LAPP’s high quality and global service for this connector standard. With the quick-connect system, LAPP has developed a robust and practical locking mechanism. It is compatible with the market standard and makes connection child’s play. Both halves of the connector are securely locked and protected against vibration. The EMC version prevents electromagnetic interference resulting from high currents. Circular connectors for power supply are used in robots and machinery, as well as in wind turbines and further applications where a compact and powerful connection system is required. The EPIC POWER LS1 with quick-connect system is available in all common contact arrangements and will be available for delivery worldwide from December. It is the latest addition to LAPP’s LS1 range of power connectors. LAPP will be exhibiting the new EPIC POWER LS1 with quick-connect system at SPS IPC Drives 2018 in Nuremberg, in hall 2, stand 310.